This tower is 95 feet tall. The man at the top of this tower is the manager of my department. Yesterday a team of us upgraded the wireless connection to aviation. Aviation is a mile down the road from the computer center, and we use a standard home wireless router, connected to a 16db antenna mounted 95' in the air to get them their network link. I've never seen this before with ordinary household wireless access points. (linksys, from cisco for $75 at fry's). And they were running this way for over two years. But to do so, we had to run new lightning resistance, new grounding cables, drill holes in this wall stuff they call "cement board", route new network cabling. And basically get a crash course in electrical wiring for networking in a heavy lightning environment. I learned that copper grounding should never touch galvanized steel! It was a full team event for an entire day, and it was some work. The men on this tower are over 50, and they are trained telephone workers. Why is being over 50 significant? Well because one of their wives said, "can't they find anyone UNDER 50 to climb this tower?) He was up there for 4 hours! Do not worry, yours truly would never have attempted climbing a tower like this. But it was exciting being on the ground team and getting this job done. See, I don't always sit in an office! In fact, I rarely get to simply sit in an office, I'm constantly doing odd and interesting things like this. in the midst of an otherwise stressful time, I got a fun quote. I'm working on an older translator's laptop and I'm trying to repair the modem. He happened in, gave me a very firm handshake and said, "the sound hasn't been working since I spilled coffee on it, but the modem is fine." and then I asked "was the modem working recently?" "oh yes, it was working as recently as a year ago." I would have chuckled if I thought he was joking. It highlighted the difference between those who have been here over 20 years and those who haven't yet been here a year. Our water has been dismantled by a man who has done so illegally. As a result his entire clan have been made ineligible to work here. Every department has lost many employees until this water issue is resolved. It is the culturally appropriate way to handle the issue, let the clan deal with it amongst themselves. Currently, our work load has doubled since we've lost half our staff in our dept. Kendal's school is getting no maintenance or janitorial work done, neither are we. We've been asked not to use the bathrooms at work because of no water, and at home, 1 of the two bathrooms is working. But it has been raining a lot. Still, disputes over water rights went out in the 1800's in the U.S. didn't they? It is a very interesting new twist to living here, and it will be educational to see how it works out. Yesterday was one of those memories I'm never likely to forget. There are three "crisis" happening around here at the moment. But the most urgent one is that a bridge between our center and the rest of the world is sinking due to the river eroding the bank. 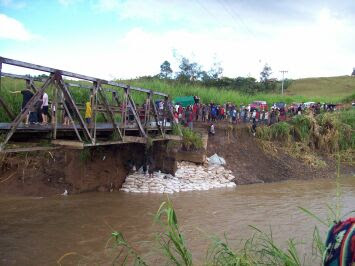 The water has been high during this rainy season and the bridge has been there for 30-40 years I've heard tell. The administration has been urging the department of public works to repair the bridge, meanwhile the surrounding communities have been upset at us for not doing more to repair the bridge. We had men in bulldozers and dump trucks trying to save the bridge, we were asking people not to drive over it, etc. It is important to know that the surrounding communities view us as an organization as a respected group, but also a rich people. Our entity has always put community outreach and relations at a very high priority, so as a result, we have a good name, well respected, but also we are depended on, and looked to when things get rough. It can be an awesome responsibility and burden at times. But enough of that. One end of the bridge has broken and dropped about two feet into the weak corner. So only 4x4's can cross, but armed guards are not allowing vehicles across now. So the public vehicles stop on one side drop off all their passengers who walk across the bridge to the other vehicle waiting to pick them up. In an effort of good faith, to show we were in fact trying to do something, the call went out for all able bodied men to show with shovels and start filling sandbags. And we showed in a major way. I'd like to set the scene for you, but honestly, this is something that'll stick in my mind alone I think. We arrived in a pick up truck, short shovels in hand. The bridge was sunken down, the blacktop cracked. 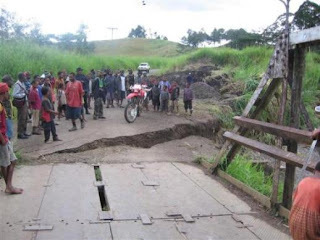 Three hundred papua new guineans were standing around the line of vehicles, under them, wherever they could get protection from the rain. Another fifty PNG men were standing on a hill of gravel, along with 50 or so from our center. People were standing, talking laughing, smiling, waiting. Crowds and crowds of people, watching this spectacle, and people walking across the bridge, being dropped off, walking. I met several people I knew heading back and forth. Then a dirt bike pulls up and drops off 300 sandbags, leaves and goes for more. Dozens of us shovelling, bagging, dragging, dropping bags over the hill to the men below in the river packing them under the weak corner of the bridge. It isn't long before the 300 bags run out. I'm shovelling shoulder to shoulder with men from here I haven't yet met, and men from PNG whom I may never see again. But it was good, hard work, honest work, and work shoulder to shoulder with the community. I felt like I was really doing some good. I'm not sure if the bridge will hold, but working along side the men of the area was a very satisfying event. And who doesn't like working on a bridge?! Soon another 50 bags came, rocks flew into bags. Someone brought by a few cases of coke which was fun, the png men dove into them! Waiting for more bags we talked about the bridge, got to know some folks, I played and joked with some of the kids. Almost everything we did was better than television for them. When I walked on the scene they seemed to murmur and whisper in awe. It felt like a challenge, "can he work twice as hard since he is twice as big" is what it felt like. I worked harder than I had in a very long time because of the extra urging. Ironic to me that only two weeks before I had been shoveling gravel for my own driveway. Today I am not even sore. Perhaps it was conditioning and God's timing! The bags filled up and went away. Some people arrived across the bridge who had been out of town. The call was put out that day "come home now, or you wont' be getting home" so we lugged their luggage across the bridge into new vehicles and got them home. The river was rising, and we covered the sandbags with chain link fence, and drove it in with spikes. Under the sandbags was special protective fibre cloth to hold back erosion. None of us were sure all the work did any good for the bridge, but we were all pretty sure the work did good for the community relationships as well as our own personal relationships with each other. I was glad we went, I am still glad we served, I don't think I shall ever forget that day. I hope that I do, I hope that there are so many more alike events that this one will become blurred into all the other times when I'm working side by side the nationals here to accomplish an important task. But for now, this one is burned into my mind's eye, and I am very encouraged and blessed by God to have been in that situation. emergency #1 - the bridge - without this bridge we can not get groceries trucked in, fuel for the airplanes, or any other such supplies. We can not leave except by plane. The plane schedules will take another drastic hit as they decrease passenger weight for fuel weight. emergency #2 - our water supply is out. Someone in the night (we think) dismantled the water pump system. We are now completely on rain water, but it is raining a lot! emergency #3 - this one is all but over soon, but work permits and visa renewals are still in progress, meaning no one can leave or enter until this paper work is approved by the government. PRAISE GOD that we have planes to get out, we have rain to give us water, and that recently the Work Permits were approved and they began on the Visas. Things may sound tough right now, but if you look at it a different way, God is providing! animals don't often get fat here. the beef here has very very little fat in it. Which sounds healthy, but the result is very tough meat. Burgers don't taste the same. Hot dogs as known in the States, do not exist. One of the bigger culture shocks here for folks from the States is that of the beef. Hamburger and hot dogs simply don't taste like they did. And then, there is steak. I wasn't a slouch in the grilling department before moving here. But I have yet to make a decent steak. I've attempted 3 times, on special occasions. The first time, I didn't know about the toughness, and we got a gamey tasting super chewy plate of rubber. I only used a dry rub with spices we had brought from home. Then I tried tenderizing and marinating. Back home, if you tenderize with a spice or a salt, you normally give it at max, 3 hours to soften the fibres. So I marinated then tenderized with some meat tenderizer spice from Costco. Still super tough, but good taste. This time, I decided (last weekend) to tenderize the tar out of it, and soaked it fo 2 days in tenderizer, vinegar, lemon. But what I didn't realize was that my tenderizer had salt in it. And I marinated in teriyaki. So... I essentially made beef jerky. Super dry, super salty but wow.. not so tough! I think, try four (sometime in the next few months) will prove more favorable results. I'm on the verge of giving up. Your diet here is a challenge for variety. Chicken and rice constitute a large portion of our meals, but my wife is incredible and has flourished as a cook here. We have been here long enough to adjust to most of the "odd" tasting meats. It's 3pm on Sunday and our yard is full of children from the neighborhood. 2 Americans, 3 Finnish, 8 Papua New Guinean. there's a line at the trampoline my neighbors have (we share a yard) there's a line at the basketball hoop, there's a line at the tree swing I made. It is Sunday and our yard is chirping with activity. I enjoy all the children but there are times when you would like it to be still outside. No blessing is without its price. Yesterday Calvin gave a bag of his old clothes to a friend he made across the road. A young PNG boy. That boy left the bag out in a field, and when you leave things out, the general idea is that all can come take what they want. Add to that there are two children with a slight reputation for taking more than their fair share, and you have a formula for upsetting the neighbors. Today there was a knock at the door. In Tok Pisin the man told me, that my son had come to his house, gone inside and accused his son of stealing. The man was calm, we sat down and brought the children around and discussed this serious issue. Apparently, the boy who took some clothes, assumed it was free for the taking, and once CAlvin handed over the clothes, it shouldn't have been our issue. But his friend came to him, explained that he never got any trousers, and Calvin got mad. So mad he walked down the road to the boys house, went inside without permission and accused him of stealing. So now I found myself sitting outside with this neighborhood man whom I only know a little, having a calm conversation, getting all the witness accounts (all the children weighed in) and we determined that there was a misunderstanding followed by a wrongful act on Calvin's part. So Calvin and I went inside, and we talked about how it's not right to accuse people falsely, how to control temper, etc, and he went down the street this time to apologize. IT's not that cut and dried, but that's what happened. I found myself in a sort of kangaroo court, everyone was looking to me to resolve the issue, and I'm desperately trying to understand this super fast Tok Pisin. Thankfully, I held my own and it was resolve amiably. I half admire Calvin's gumption, but I wish it hadn't resulted in a cross-cultural conflict. As Kendal and I chatted this afternoon she noted, "Sometimes, parenting is exhausting". So true... so true. Our kids are getting older, the parenting challenges are getting to be more and more unique. Today my daughter decided to paint her bedroom floor in blue paint. She thought it'd be fun. IF you're praying for us, pray that we be given an extra amount of wisdom and patience regarding parenting, because these kids are REALLY keeping us on our toes these days. Email is to missionaries as blood is to the heart. It carries our messages throughout the world and it communicates to us from our families. For this reason, the #1 priority of the network staff here is to keep email up. Processing email, protecting email, quarantining email, forwarding email, takes up a HUGE portion of our time. So then their email has to follow them. We came up with a vision "what if your email worked, wherever you were, without having to change settings?" We began this project months ago. Pecking at it over time, with technology I was not fluent in, completely ignorant of, or simply had never even heard of before. I'm a unix guy at heart, but we use Microsoft mostly here. So, today, I'm pretty excited and mostly only geeks will understand why. I got exchange email to work securely through a netscreen firewall via ISA2006 publishing! What does that mean? It means that email won't break when people move around. It means that very soon (when we go live with it) the missionaries here won't have to have their workstations re-configured when they get here before email works. and it also means that there will not be the odd, 3 day window where someone gets here on a friday and their email doesn't work until Monday because CTS is closed. I'm pretty excited about this success. One of the things I want to do here is not only keep things running smoothly, but improve systems so that there is less time "in the shop" so to speak for the folks. So far, I believe we're doing a pretty good job of it. Thanks and praise to God for somehow giving me the smarts to solve the issues we ran into. Before we get too far into this, I need to say, I am NOT inept at changing tires. I have done so plenty of times. This morning it was raining, and my daughter was staying home from school with a cold. Which means we now have the problem of how to get my son to school, dry and on time. No problem, we hop in the car. The car has a flat. No time to change it, I'll do that at lunch. Fast forward to lunch time. It's raining HARD. I know if I don't change it now, my son will get SOAKED coming home from school. So I begin the process of changing a tire on a 4x4 in the rain and mud. Challenge 1: the jack was too short/too tall depending on where you put it. Finally using a series of blocks of wood, and jacking, lowering, jacking again, I get the tire off. Challenge 2: my car has no parking brake. It rolled forward, the wheel went into the mud. NOT the tire, the wheel. I use blocks of wood, jack it up for the fifth time, and clean the wheel and brake after putting blocks of wood in place around the tires. Yes it was in gear. It was more the muddy ground that gave way than it was the gearbox. Challenge 3: as I'm laying in the mud, and soaked to the bone, I feel sharp stings on my waist and belly. Oh.. they are black ants. Ouch. Only a few got me, that's good, keep working. Black ant bites aren't as bad as red ants, but it's been over an hour and it's still pulsating sting. The stings come in waves so you feel like you keep getting bit every few minutes. Anyway, it's a nuisance only, but my first black ant bite here. Challenge 4: the spare tire won't go on.. it's 1/2" too tall, I can't raise the jack any more. SO.. ironically I begin digging away the gravel and stone that jsut THIS LAST SATURDAY I had spent half a day shoveling and spreading into place to avoid ... MUD which I was now lying in. All of this is going on and I look up and see 5 or so little Papua New Guinean kids standing ten feet away, watching me. I had an audience. I thought in anger "why are they staring at me? this isn't a show!" I wanted to holler, "GO AWAY!!!!" but I didn't, I have come to realize whatever I do is like television to these kids, and they watch me all the time (envision Mr. Incredible at home with the kid on the big wheel staring at him). So I didn't, my temper was up because of the difficulties and I wasn't really upset with the kids. But then, he stepped forward and quietly said in accented english, "Can I help you?" A ten year old boy, offering me help. I laughed and said "no thank you" and realized, I must have looked the 3 ring circus I felt at that particular moment, enough to have this young boy feel I needed assistance. "Why throwing nails on the road is BAD". But I haven't, instead I decided to let you use your imaginations and have a laugh at my expense. I'm already laughing about it. We treated the kids to a new place 15 minutes up the road. Imagine K.F.C. with flies and lizards, and the food takes 30 minutes to arrive, and scratch the variety. The menu has "#1, #3, #5" that's it. It was like an oasis to us! but I spoke with him a while and found his name and apparently his reputation is decent as a coffee maker, but he does tend to hound people. So I expect I'll be seeing him again. Then he left, he had come into the restaurant because he saw us go in. Next to me was an older gentleman who gave his approval of the coffee, and we talked. It was hard to hear inside with the music being so loud, but he told me about his eye, and how it's "rotting". Older men here tend to have eyes go bad. I've seen it on more than half a dozen people but I don't know what causes it. The eye turns brown or black and they lose much of their site in it. I suspect it's related to diet. He hadn't gotten to the point where he was asking for money, but he started to get there. This happens from time to time, but it happens everywhere. We talked a bit, I shared some chicken and chips (fries) with him, and he was a very nice older gentlemen, sitting inside the restaurant for no real reason other than to people watch, he hadn't ordered any food. It was a good time of simply conversing with total strangers. I don't know why I blog it now other than to mention, it was an enjoyable outing. I had the privilege of working on a computer across a desk from two translators beginning their typesetting stage. side note: If you feel that I say "at least to my current understanding" too often, it is because the way things work around here seem to me very much like an onion. The time you spend here determines how many layers into the onion you get. So I am cautious because if a very seasoned translator were to read my blog they may feel I have an incomplete grasp of reality... which is very very likely. This blog is a representation of life here as I understand it. I can liken this process most like buying a new car. The translators were happy, smiling, they has jsut finished their New Testament, and now they were ushered into the ROOM. The room where the guy finalizes all the paperwork, has you sign, and asks if you want the clear coat. Only, in the typesetting process there is no salesmanship going on... but ironically there is a clear coat. As I worked the translators decided on the type of binding and cover, leather? What color leather? Then the lettering, gold lettering? Red lettering? Then the maps, tri-color or full color maps of the Ancient World? There were many decisions to go through and samples were looked through. Meanwhile, on the computer I was working on, the national lady hit a few buttons and the computer software began reading in text and outputting (Adobe InDesign) formatting. Pictures, verses, footnotes, cross references. I have seen computers do a lot of beautiful things in my life. But I can not explain to you what happens in the Christian geek's heart when he sees a computer automation compiling and formating Scripture into the final product of what this Bible will look like! It was amazing, and I felt like sitting there and watching it work all afternoon. They use a combination of Paratext6.1, Publishing Assistant, Adobe Photoshop, and Adobe InDesign, with macros developed in Dallas, to put the project together. Once all the little pieces are put in place, then the automation macros build the Scripture. It gave a new meaning to God breathed for me, because it felt as if the words were being breathed onto the pages. Blank pages a moment ago, then words and formatting began appearing. It was very special to see that coupled with the translators making the decisions on the appearance, decisions that typically involve the village nationals that they are working with. And yes, there is a clear plastic cover for the Bible because after all we are in a tropical rainy area. So.... "would you like the clear coat with that?" may make you smile the next time you hear it at the car dealership.